Anyone can grow mushrooms at home. The proof is that I did it and if I can do it, then anyone can. However, the method I used was a quick and dirty one using kitty litter and oyster mushrooms, which are very aggressive and will grow on almost anything. If one wants to expand her/his repertoire beyond oysters, different more-demanding procedures are needed. Stephen Russell’s recent book provides an introduction to mushroom cultivation and considerable how-to detail intended to help a beginner get started (or a non-beginner to become more advanced at) growing a variety of species. The book is divided straightforwardly into three parts—Basics for Beginners, Intermediate Methods, and Advanced Methods. Part 1 includes four chapters—Getting to Know Mushrooms (a brief primer including some biology, human uses of mushrooms, an overview of the cultivation process, and summary information about the four mushrooms mentioned in the book’s subtitle); Basic Growing Options (including ready-to-grow kits, using pre-made grain and plug spawn, growing on logs, and using spore or liquid culture syringes for inoculation); Combating Contaminants (the importance of sterile technique and a summary of common fungal and bacterial contaminants); and Your First Grow (a step-by-step guide to the “PF Tek” method). For those ready to progress beyond the basic method, Part 2 includes six chapters with self-explanatory titles—Pressure Cookers and Flow Hoods, Grain Spawn, Casings, Liquid Cultures, Working with Sawdust, and Midsize Fruiting Chambers. Part 3 presents information for those who want to get very serious about cultivation with three chapters—Agar Cultures (developing and maintaining your own library of strains), Large-scale Grain Spawn, and Bulk Substrates (the last two chapters for those who want to produce large quantities of mushrooms). A short list of resources and a general index follow Part 3. The strength of the book lies in its being based on Russell’s own experiences as he progressed from a beginner to an expert in cultivation. Overall, it is fairly clearly written (there are places where some editing would have improved things) and is illustrated with lots of useful color photographs. Thus it should be effective in helping most people learn the basics of cultivation. However, don’t be misled by the subtitle. 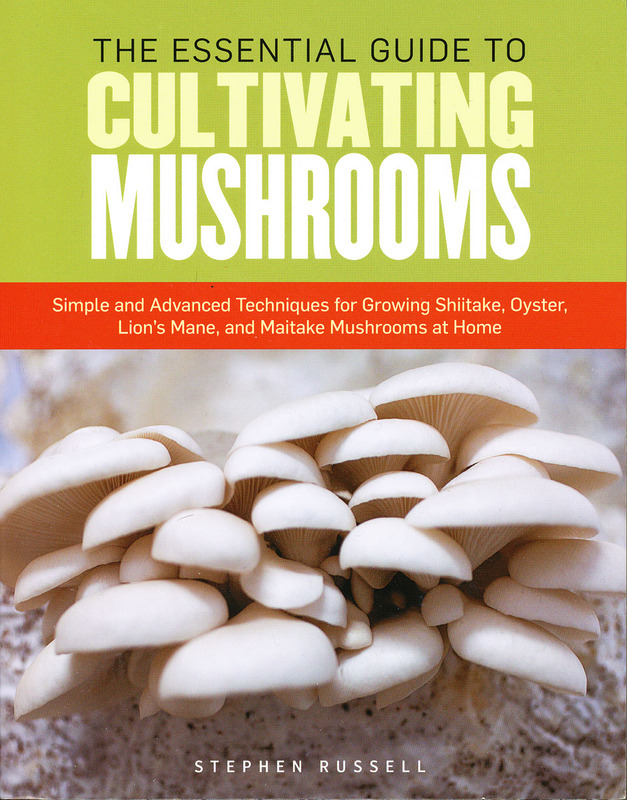 This isn’t a guide focused on “Growing Shiitake, Oyster, Lion’s Mane, and Maitake Mushrooms” although the information provided in the book will allow one to do that. You just have to put some work into pulling together the necessary information from different parts of the book. The basic approach presented in Chapter 4 (Your First Grow) is the PF (Psilocybe Fanaticus) Tek method developed for growing “magic” mushrooms, which happens to be illegal. Although it does provide an introduction to most aspects of growing mushrooms, it isn’t a method that would normally be used for any of the four focus species in the book’s subtitle, especially not for producing them in quantity. Although nearly all the steps in the method are well illustrated, there are no photos of the end product—mushrooms fruiting. Thus, one might wonder why this particular approach was taken as an introduction, rather than one of the many other simple methods available or perhaps just a general treatment. In reading through the book and envisioning myself trying to follow the methodology, there were places where some additional explanation would have been helpful. For instance, there are numerous references to “PF jars” in the early part of the book, which led me to think that these must be some special thing. But no, in Chapter 4, I learned that they are merely ordinary, wide-mouthed, half-pint canning jars. Russell refers to them as PF jars because they are the containers used in the PF Tek method. A glossary would have been useful in this case. There are a number of places where I would take issue with the way terms are used (for instance, the “flow hood” he describes is not a hood at all, merely a blower box) and the explanation of the underlying science (for instance, spores don’t mate), but these shouldn’t prove to be impediments to the practical use of the book. If you think you might be interested in growing your own mushrooms, this might be a good place to start.